Now a days the infuence of so called Vastushatra is spreading rapidly and is affecting daily life of many people in India. Self declared Vastuvisharad, Vasturaviraj and Vastutadnya (Architects without any Degree or Certificate) are openly moving around us saying that they are having solutions to our personal and family problems. The problems covered include health, loan problems, business loss, court matter, marriage problems, fertility issues, unemployment etc. They have related these problems with the designing of our house vis a vis directions of different rooms in our houses and offices and even factories. They also gives assurance of happiness and wealth, if we follow their instructions while building our homes. Well educated and the well off class in India are seeking their help. Vastuvisharad’s are using scientific jargons like electromagnetic field, positive and negative energy, cosmic energy, quantum theory without any hesitation to fool such so called educated but gullible people. Actually they don’t know these scientific concepts. So called Vastushatra is Pseudo Science because it doesn’t follow scientific methodology. Their theory is mainly based on eight directions. We can apply a simple law of science which many of us have been studying from 3rd standard, for which Galileo was punished by religious authority, because he declared that the earth rotates around the Sun and revolves around its axis. Earth rotates around itself in 24 hours at a speed of 1600 km/hour. At the same time it also revolves around sun at a speed of 1,00,000 km/hour and completes one revolution in 365 days. Accordingly our house which is on the surface of the earth will rotate along with the earth in 24 hours. Along with it the kitchen, bedroom and living room will also move. This means that every time our home will face different directions. Keep in mind that we are also using many more wrong concepts related to astronomy. Sunrise and sunset are also been misused concepts. Actually sun is not rising, it is at fixed position. Earth is rotating around itself from west to east. So early in the morning we observe that sun is rising from east. 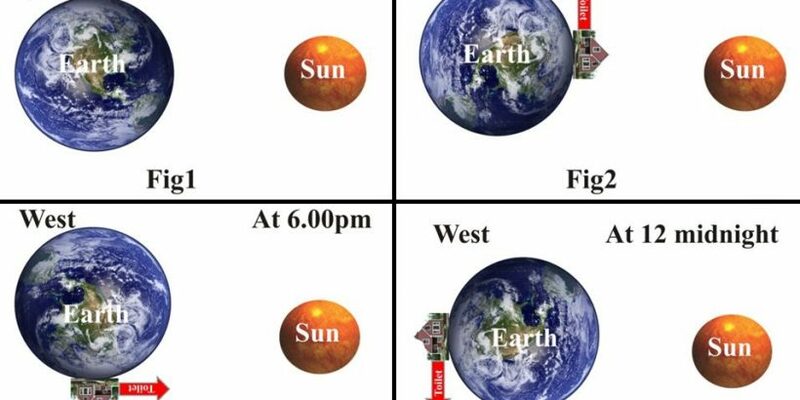 As earth goes on rotating we will observe the sun to be above our head at 12.00 noon. And during evening we observe sun set, according to our understanding. According to pseudo scientific vastushastries the toilet should be towards west. If design is wrong all family members will suffer health problems. Toilet towards east then all members of the family will get diabetes, towards north will get heart problems and towards south will create cancer. What a ridiculous proposition! As far as common sense is concerned nobody should believe in such preposterous outcomes. But in reality the reverse is happening. If we apply simple class three scientific knowledge to their toilet design, we will be surprised. Lets have a toilet based on vastushastra knowledge in West direction. In the morning at 06.00 am we move towards toilet as shown by Fig1. 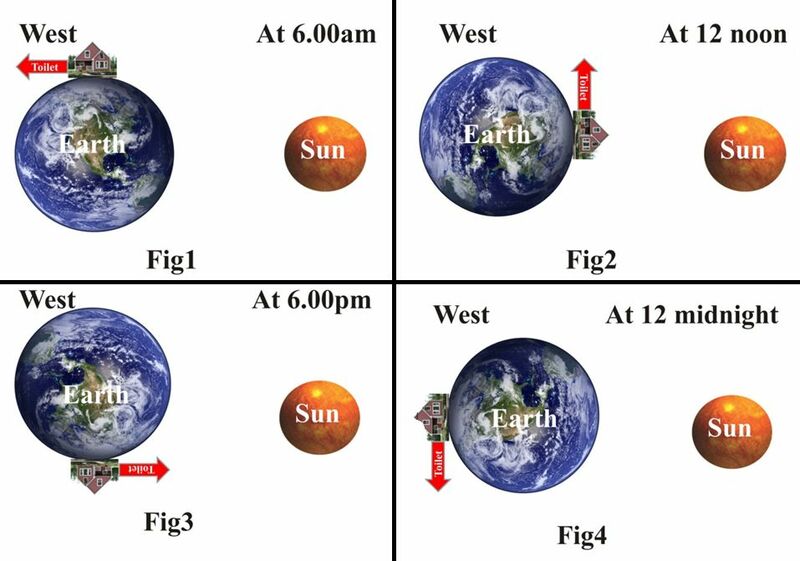 As earth rotates around itself from west to east, at 12.00 noon sun will be exactly over our head. But the direction of toilet will be upwards shown in Fig2. Similarly in the evening at 6.00 pm and at midnight 12.00 O’Clock the directions of toilet will be totally different. (Fig3 and Fig4). In this way for every minute or hour toilet direction will be change and be different. Now how the heck can we apply the direction principle of the vastushastries in this situation? How foolish are vastushastris ? and up to what extent they are making the mindset of Indians so unscientific? This is not good as far as as the future of our children and nation is concerned. (In the figures given above, for our understanding we have made sun small and earth bigger . In reality this is not the case). From above figures it is clear that as toilet moves continuously, bedroom, kitchen also moves. Nothing is at rest in the universe. It is very silly and unscientific thing to connect directions with our daily happenings. My basic question is why should we give the right of designing and building our homes to such kind of foolish Godman who don’t know even the basic laws of science. The design of our home should be decided by our family members in consultation with Architects. Engineers and Architectures are the only authorized persons in this field. Our family problems are not created by house designing. They are either man-made or due to natural situations or calamities. Only we and our family members can overcome these with their own endeavor. Our home should have proper ventilation, strength, security, full use of sunlight, drainage system etc. This is the real design of house. In the solar system the sun is our biggest partner. It’s shares in our life is 99.86% while all other eight planets contribute only 0.14% . So if our earth can be compared with a sand particle compared to a football sized sun, then on this sand particle like earth how much part will be occupied by our house and toilet?. What a strange co-relation has been fabricated by this fake industry. One more thing, if we move outside the earths atmosphere into space then what are the directions? There are no directions in space. So dose it mean that the so called vastushastries fail to solve astronauts problems? The directions were created by mankind to understand the space around us on earth they do not have any influence on our life or our wellbeing. It is a shameful thing and a big joke that so many so called educated and sophisticated Indians are believing in such unscientific trash dished out by zillions of dubious vastushastries in this scientific and technological era in the 21 st century.